Easy to make, amazing apple cinnamon sweet rolls drizzled with a sweet maple glaze. These need to be part of your weekend brunch plans! 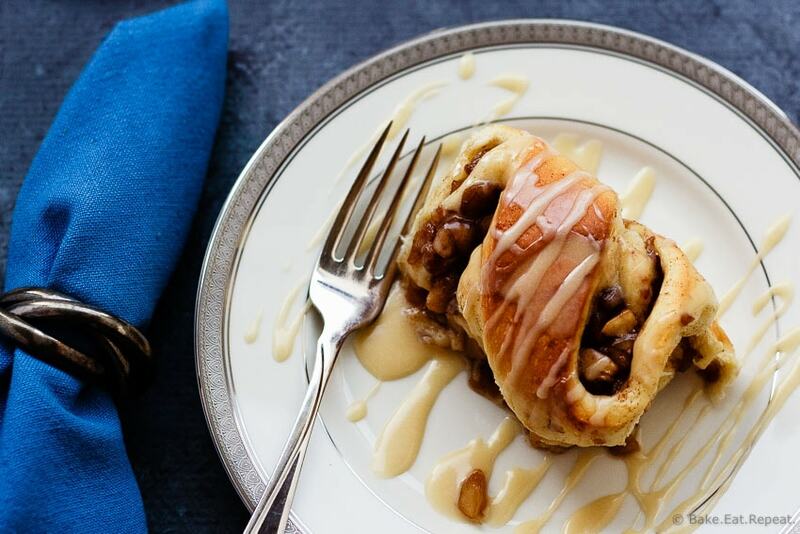 Apple cinnamon sweet rolls with a maple glaze. That’s what we have today. You should definitely run to the kitchen and make these for your weekend brunch plans. Because you need these in your life. Really. Of course, I probably say that about every sweet roll recipe I share here. But that doesn’t make it any less true. These apple cinnamon sweet rolls are a variation of my cinnamon bun recipe, but rolled up into cute little twists like these chocolate orange sweet rolls. Not that the twist is necessary. You could totally just bake them like regular sweet rolls without the twisting part. But twisting does make them awfully cute, don’t you think? 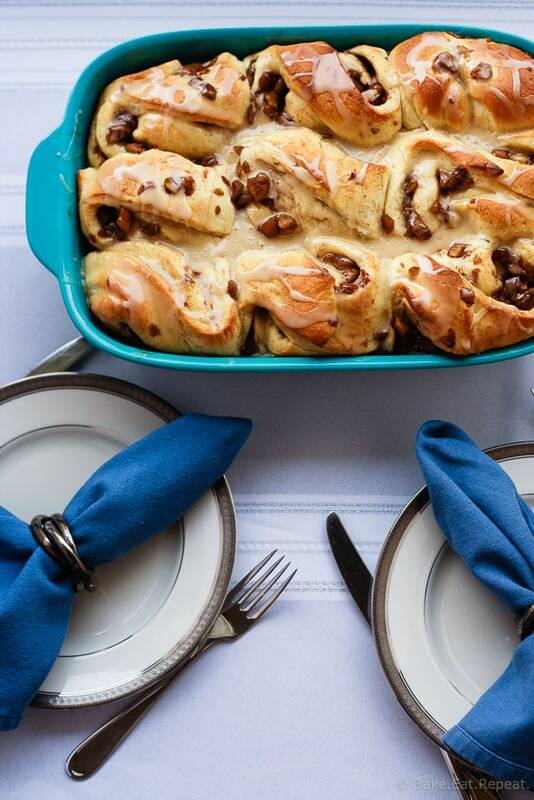 I baked these rolls up in a beautiful new stoneware dish from CW by Corningware. I love the bright colours of these dishes, they’re so much prettier than the plain glass ones I usually use! They look lovely on the table and add a nice bright splash of colour to the meal which I love. Perfect for a special meal or holiday brunch. Or just a regular day – because pretty dishes are always nice! World Kitchen has also offered to give a Corningware 2.5 quart vermilion stoneware dish to one of my readers. These dishes are lovely, so don’t forget to enter the giveaway for your chance to win! Make sure to scroll down to just below the recipe to enter. And then go make some sweet rolls for an amazing addition to your weekend brunch. Or just because. You don’t need a special occasion for sweet rolls in my opinion. We happily ate my recipe testing results for supper (and a number of breakfasts I might add, because I couldn’t make them just once, quality control and all that!) one night with some eggs, because breakfast for dinner is always a good idea. Especially when it’s a breakfast consisting of sweet, fluffy, perfect dough twisted around a divine apple cinnamon filling. Topped with a maple glaze, these are pretty much heaven on a plate. 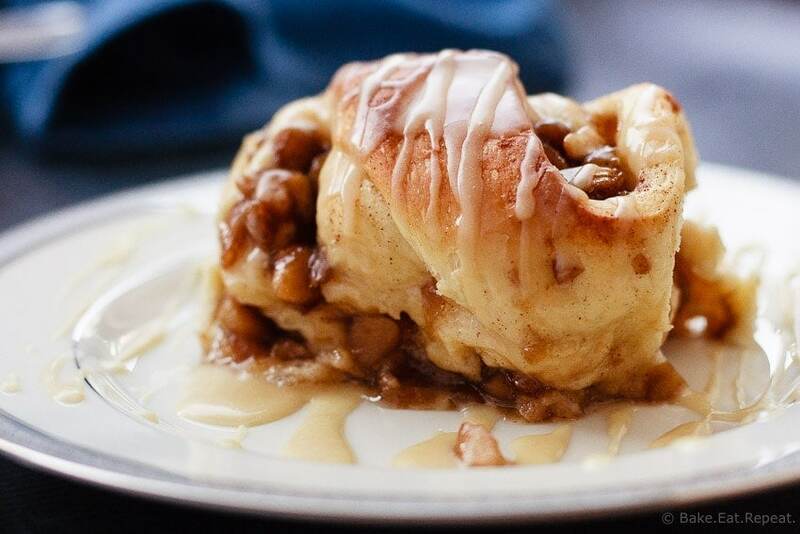 Apple cinnamon sweet rolls drizzled with a maple glaze. Does it get any better than that? I really don’t think so. Disclaimer: This post was sponsored by World Kitchen, and I have been compensated for my time and provided with product. As always, all opinions are my own. In the bowl of a stand mixer with the paddle attachment, or in a large bowl with an electric mixer, cream together the butter, salt, and sugar. Add the egg and mix until smooth. Switch to the dough hook on a stand mixer (or a wooden spoon if mixing by hand), and add the flour, yeast and buttermilk. Mix on low speed until the dough comes together into a ball and clears the sides of the bowl. While the dough is rising, prepare the filling. In a medium saucepan, stir together the butter, brown sugar, cinnamon, corn starch and diced apples. Cook, stirring occasionally, over medium heat until the apples are softened and the liquid is boiling, about 5 minutes. Reduce the heat to a simmer and continue to cook, stirring, for another 2-3 minutes until the liquid has thickened slightly. Remove from the heat and allow to cool before making the rolls. Punch down the risen dough and turn it out onto a lightly oiled counter. Roll it out to about 1/4 inch thick rectangle, about 12 by 14 inches. With a rubber spatula, spread the filling over the dough, leaving 1/4 inch space around the edges. Starting from one long side, roll the dough up into a log, keeping it even as you roll. Pinch the seam closed with your fingers and lay the log seam side down on the counter. Using a serrated knife, slice the log into 9 even pieces. Pick up one roll at a time and stretch it, twisting it into a figure eight shape, and laying the twisted roll in a 3 qt/2.8 L baking dish (I used a stoneware Corningware dish). Repeat with the remaining 8 rolls. At this point, you can either refrigerate the rolls for up to 2 days, pulling them out 3-4 hours before baking to let them proof, or let them proof (rise) at room temperature immediately for about 90 minutes, or until the the buns have doubled in size. Preheat the oven to 350 degrees F, with a rack in the middle of the oven. Bake for 35 minutes or until they are golden brown. Allow to cool for about 10-15 minutes. While the rolls are cooling, make the glaze. In a small saucepan over medium heat, melt the butter. Whisk in the maple syrup until combined. Add the powdered sugar (icing sugar) and whisk until smooth. Remove from the heat and drizzle over the cooled rolls. Serve warm. Leftovers reheat well in the microwave. Source: Adapted from my cinnamon bun recipe . Hi, these rolls looks so good and the apple and cinnamon is great for fall. I was wondering, what kind of apples did you use? I've used a couple different kinds - apples from my sister's tree and gala, which happened to be what I had on hand. Both were really good, even though they're entirely different apples (the ones from my sister are similar to a granny smith). I think you could use whatever apples you like and it would be wonderful - although I know if I went to buy apples specifically for this type of baking, I would use a mixture of something tart like granny smith, and something sweet like gala. Didn't mean to send two comments, but when I tried to send the first one, it said that I was sending a duplicate and it didn't seem to go through. So I shortened my comment and that one went through just fine! Sorry about that! The recipe calls for 3/4 buttermilk, but it says to add 1 1/8 cup in the directions. These look soooo good! Hope to make these in the next few days and was looking over the recipe. Don't know if it is a misprint, but the recipe calls for 3/4 cup buttermilk, but the directions say to add 1 1/8 cup with the other wet ingredients and add more buttermilk, if the dough is dry. Hoping you can let me know, before I try this. Hi Barbara - that was a misprint, thanks for letting me know, I've fixed it now. Sorry for the confusion. It's 3/4 cup of buttermilk - I used my cinnamon rolls recipe and just changed what I needed to in the ingredients but missed that in the directions. And no worries about the multiple comments! :) Hope you enjoy the sweet rolls, let me know how they turn out! Haha, yeah the stuff I had was from my shower too - 15 years ago! I was excited to get some new stuff! 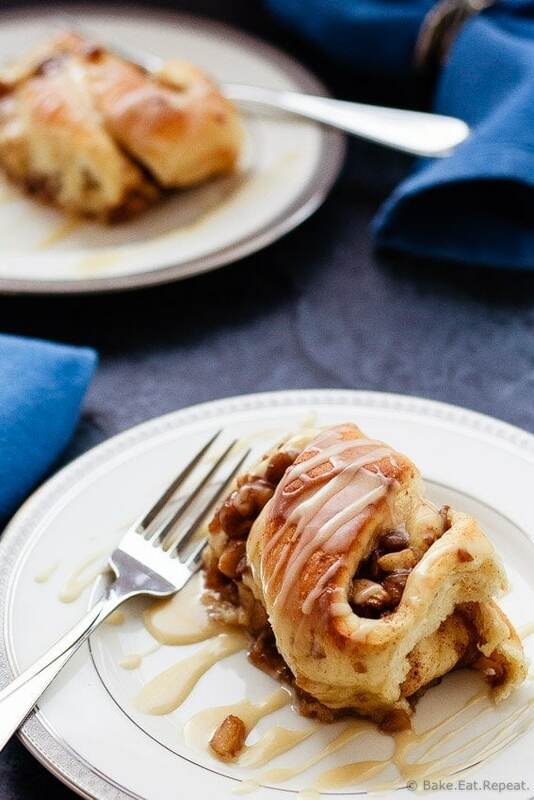 The Apple Cinnamon Sweet Rolls look absolutely heavenly! I can never have enough of cinnamon rolls, these look so delicious with all the apple Stacey!! That recipe looks so good! The perfect fall comfort food dessert! Breakfast - totally breakfast! Or yeah, dessert. But since I can get away with eating it for breakfast I definitely am! :) Thanks! I could so totally go for one of these fresh out of the oven! I am loving those dishes -- so pretty! You had me at "maple glaze," Stacey. These look like my dream breakfast! I love corningware! I still use old corningware from the 70s. They are not as cute as the dishes in your blog post, but they still work! Thanks for the chance. I love the fun colours of these corningware dishes. love them! These rolls look like what I want every morning! I love the twist in them! Wow those look yummy. Thanks for the chance and Happy Thanksgiving. Thanks so much! Have a great Thanksgiving! Ohh wow! These look so good!! I need to seriously start making cinnamon rolls more often! Yours are so beautiful, Stacey! Love the apple! These look so good! The perfect fall flavours! Thanks so much Jonnie - we love apples and cinnamon around here, especially in the fall! Will that corningware dish help me make the amazing things you make? Can,t wait to try these rolls! Pretty sure you already could - if I can, you can! :) Thanks Catherine! Love anything with cinnamon & Apples. Will definitely make this. Thanks Louise - hope you like them! So the apple rolls will have to wait til next weekend. My Mom ordered a few boxes of BC apples from a church sale in our city. For today though, perhaps dinner rolls seeing as how Thanksgiving supper tomorrow! Mmmm, BC apples in the fall are the best, I love when I can get those! Happy Thanksgiving! Finally, a fall recipe for a baked good that isn't pumpkin! I love this! Well, I'll admit I love pumpkin just as much as apples, but I need both in the fall! And the apple cinnamon might just win over pumpkin, it was pretty amazing! Thanks! These look SO delicious, Stacey! They'll be a yummy treat for breakfast on this Thanksgiving Weekend! Happy Thanksgiving, by the way!!!! These look SO awesome, Stacey! They'll be a perfect breakfast treat for this Thanksgiving weekend! Can't wait to try them! Those cinnamon rolls look so good. One of my favourite desserts! These are totally gorgeous! Makes a perfect fall breakfast! Yummy! I need to try these soon! They look delicious! I love anything with cinnamon and apples. Me too. It's always a good idea! Thanks Elise! That's cause they are! :) Not hard with cinnamon and apples though! Thanks Therese! There's 4 different colours in the new CorningWare too, and all super bright and colourful - I really like them! And you can't go wrong with apples, cinnamon and sweet rolls right? Thanks Belinda! Thanks Rebecca! Sweet rolls always make the perfect breakfast with some coffee right?! Sweet rolls are the breakfast of dreams- delicious! I have never seen more beautiful cinnamon rolls!! Love the apple addiction, look amazing! You are so right, I need these in my life. I love sweet rolls and the apples are perfect right now. And that glaze.....love! Apples are so perfect right now, I can't get enough of them! We're going through them like crazy! And sweet rolls are pretty much always awesome! Thanks Erin! These sweet rolls look amazing! I love the apple cinnamon flavor; it's so perfect for fall!